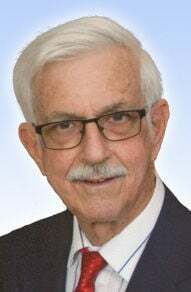 FARMINGTON – John R. Crouch, of Farmington, entered into eternal rest on February 6, 2019, in Farmington at the age of 71. He was born on March 1, 1947, in Bonne Terre, Missouri to the late Dr. F.R. and Mary (Manley) Crouch. John was the original founder of Crouch Farley and Heuring PC CPA firm in 1975. He was proud to lead the expansion of the firm in Farmington and established other locations in Southeast Missouri. John was a member of the St. Joseph Catholic Church serving on the finance commission for many years and led the committee that built the parish center. He was a member of the Knights of Columbus, the Farmington City Council and the Missouri Society of CPA's. He served on the Parkland Hospital Board from 2000-2014 and was a former board member at Farmington US Bank. He was a veteran of the United States Army. John enjoyed gardening, reading, traveling and spending time at the family farm. John is survived by his loving wife of 45 years, Kathy (Frystak) Crouch, his daughter, Jenny Crouch of Farmington, his sisters, Virginia (and husband Wayne) Harmon of Phoenix, Arizona, and Elizabeth Zelman of St. Louis, Missouri, brother, Thomas (and wife Judi) Crouch of University City, Missouri, several nieces, nephews, cousins and a host of many friends. Friends may call on Tuesday, February 12, 2019, from 4 p.m. to 8 p.m. at Cozean Memorial Chapel. Visitation will resume on Wednesday, February 13 from 7 a.m. until 9:30 a.m. followed by a Mass of Christian Burial at 10 a.m. at St. Joseph Catholic Church, 10 North Long Street, Farmington with Father Rickey Valleroy as celebrant. Interment, will Full Military Honors, at New Calvary Catholic Cemetery. Memorials, if desired, may be made to St. Joseph Catholic Church, 10 North Long Street, Farmington, MO 63640 or charity of choice. View the full obituary, the video tribute and share your condolences at cozeanfuneralhome.com.